Donald Trump’s popularity has surged among Republicans after dominating several news cycles with his anti-illegal immigration rhetoric, according to a new Washington Post-ABC News poll. Trump continues to be unpopular among the public at large, with negative marks outpacing positive ones 61-33. “Strongly unfavorable” views outnumber strongly positive ratings by a 3-1 ratio. I initially figured that Trump’s recent lead among Republicans was due to name recognition, but he was just as well known before he entered the race. The difference between current polls and May appears to be more from his actual actions between now and then. Never underestimate the ability of racism and xenophobia to energize Republican voters. 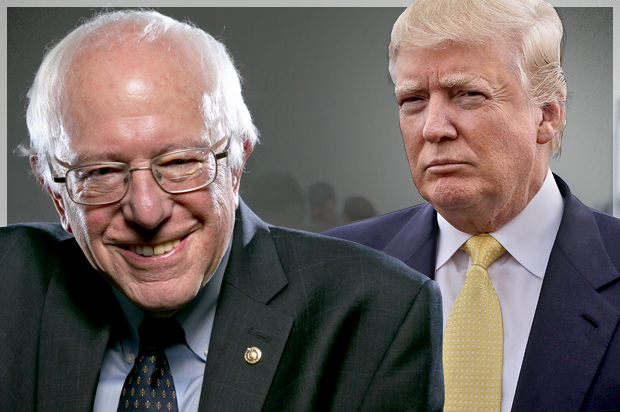 Some in the media have been comparing the support received by Donald Trump among Republicans to the support received by Bernie Sanders among Democrats. This makes a simplistic story line for the press, but is misleading. Donald Trump is surging because he is saying what the Republican voters believe deep down. Republicans have been using the southern strategy to drive support, but generally avoid being as blatantly racist as Trump. In contrast, Bernie Sanders is receiving his support from liberals who are dissatisfied with the Democratic establishment and the conservative policies supported by Hillary Clinton. So far Clinton has benefited from name recognition, gender, and nostalgia, but few are paying close attention to the issues. I doubt that most Democratic voters even realize how conservative Clinton has been on issues including foreign policy, civil liberties, and social issues, along with the economic issues which have so far framed this campaign. If Sander, or another challenger from the left, is to succeed against Clinton, they will have to demonstrate how different their views really are. I am hoping that such contrasts will come out in the debates, and disappointed that there will be so few. Posted in Bernie Sanders, Donald Trump, Hillary Clinton, Politics, Polls, Republicans. Tags: Bernie Sanders, Democrats, Donald Trump, Hillary Clinton, Republicans. RSS feed for comments on this post.. TrackBack URL. Frankly, I'm bored with all this 'Mutt 'n' Jeff' kerfuffle. What I have been waiting patiently for is some word from you on Planned Parenthood's money raising scheme. It figures you would quickly buy yet another right wing conspiracy theory. This very well could be normal payments for the costs related to obtaining and transferring tissue specimens. There is nothing to say until we have actual hard facts, not right wing hysteria. These right-wing groups have quite a history of selectively editing tapes to make a political point. There isn’t much of anything here. If they are charging $30 to $100 this is in line with what would probably be expected for obtaining, preserving, and transferring such specimens. People in health care have a tendency to speak in ways which often sound rather gross to those outside the field. Certainly this could be investigated further to make sure they are legitimate, but this looks like a selectively edited tape to play on the ignorance and biases of conservatives, and is probably just another in the long list of faux outrages invented by Breitbart and other rightwingers. Oh, and take your sickbags with you! It may or may not be anything, but without further investigation and objective facts there is not enough yet to say anything. Incidentally, did you know that since 1973 some 54 million babies have been slaughtered in the Land of the Free? Makes Auschwitz sound like a nursery school! Sorry to bore on but . . .
"StemExpress, the California-based company that serves as a middleman between Planned Parenthood and the organizations that seek body parts harvested from aborted babies, once advertised bulk discounts for baby organs and body parts. A screencap taken from a StemExpress page listing fetal liver products shows that the company openly boasted of bulk buying discounts available to new customers. The problem is that you are quoting right wing sites which have quite a history of fabricating evidence and making things up. We will need an investigation from a credible source. No, no, of course not, no 'babies' have been slaughtered just lumps of organic matter, er, although it's funny how their bits and pieces are worth serious money! "Fetal liver mononuclear cells – 13 weeks gestation & later"
Still, what's it matter because as you keep telling me those 'non-babies' don't feel anything! They are not physiologically capable of feeling anything at the time which most abortions are performed. Certainly not until well after 13 weeks. Fetal tissue is quite valuable for research and the tissue should be used if available. This research can save lives. There are also strict rules regarding this. Charging for preservation and transportation of the specimens is legitimate. It will take an investigation from a more objective source which is looking into whether applicable laws are being followed, as opposed to hit jobs from those who are looking to go after Planned Parenthood because objection to abortion and to research on fetal tissue.